On Saturday I made a quick there-and-back-in-a-day trip to the Netherlands, to attend a ceremony in celebration of Humphrey Tonkin’s seventieth birthday. He and I have been friends and then colleagues since we were both teenagers, and I was delighted to be able to contribute to the festschrift we presented to him. 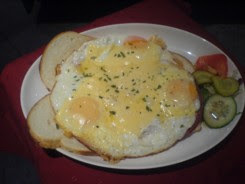 For my lunch at an eetcafe in Rotterdam I ordered one of my favourite Dutch specialities, an uitsmijter ˈœytsmɛitər. Literally a ‘chucker-out’, this is a kind of hot open sandwich with fried eggs. The diphthongs in its name can be a challenge to NNSs of Dutch without phonetic training. You can have uitsmijters either with ham or with cheese, and I chose the kind with melted cheese, met kaas mɛt ˈkaːs. You have to remember not to aspirate the k of kaas. Dutch voiceless plosives are unaspirated. There is a bit of a mystery here, since in all other Germanic languages (as far as I know) the voiceless plosives are aspirated before a stressed vowel, just as in English. So how is it that those of Dutch are not? I have not come across any historical account of why this should be so. Is it the consequence of all those years of Spanish rule of the Low Countries? Far's I know, Frisian has aspirated stops, and Low German certainly has. All the Nordic languages have them, too. Even Eastern Yiddish has them, despite the Slavic environment. Of course there are differences in degree. French influence? Sounds like an explanation after the fact. It is generally assumed that Dutch voiced stops are the result of contact with Romance, i.e. originally a Flemish feature creeping into the northern part of the Low Countries. AFAIR (West) Frisian stops are aspirated. North-eastern Dutch dialects, e.g. those of Groningen, still have aspirated vs. non-aspirated. It may be a dialect thing, since "RP Dutch" (ABN) is really the dialect of a small region near Haarlem? Perhaps in Ireland you have an out-smiter standing at the door of a club or pub, but in England he's a "bouncer" or a "chucker-out". What's wrong? That smite is a cognate of smijt-, but the latter means "throw", and the former 'hit, pain, afflict' or something. When have you last smitten rubbish in the dustbin, or a ball to a friend? Well, yes, old-fashioned RP has that too, though not exclusively. Isn't/wasn't lack of aspiration a feature of traditional northern English and Lowland Scots dialects? If the soundcomparisons.com website is to be believed, voiceless plosives are not aspirated in Frisian. Anglicisation of [ɶy] is an interesting one. (Footballer) Johan Cruyff is known in England as /krɔɪf/, but when Dirk Kuyt came to Liverpool a few years ago commentators settled on /kaʊt/. And the Kuiper belt, named for Gerald Kuiper, is /ˈkaɪpər/. I wonder if there are any instances of [ɶy] becoming /əʊ/. Very West Frisian. Sounds like a Dutchman to me. At least North and East Frisian are aspirated. Now that could be a German or Low German influence just as well as the lack of aspiration in (some?) West Frisian could be tthe influence of Dutch, but I tend to believe the latter. the ways of anglicising are only in part phonetic, I think, and in part a matter of how the spelling is interpreted. Of course, you can also have an uitsmijter with both ham and cheese. Although somehow I think egg doesn't go with cheese that well. Upper German dialects, and Austrian (and presumably Swiss) Standard German, don't aspirate. I had to learn aspiration in school, complete with the trick "hold a sheet of paper in front of your mouth; if it moves, you're aspirating", during the first year of serious English lessons (...and I was not taught the rule to drop aspiration behind /s/, and didn't figure it out on my own). Of course, that doesn't explain the mystery for why aspiration is lacking at the other end of the dialect continuum! French influence looks like the simplest explanation there. Also, with the exception of (roughly) the Carinthian dialect with its big fat Slovene substrate, there are no voiced plosives or fricatives* south of the White-Sausage Equator. This leaves the Swiss with a length contrast, the Swabians and the eastern Austrians with no contrast at all, and the rest (like me and the Austrian standard) with an unaccompanied fortis-lenis contrast; no voice, no aspiration, no whatever-the-Koreans-do or other glottalization, nothing. I think it's a matter of lung pressure which might manifest in slightly increased voice onset time for the fortes (below the aspiration threshold) and perhaps in, on average, slightly increased length, but the latter feature (if real) doesn't appear to be consistently present, and there's already a length contrast for fortes (merged with the fortis-lenis contrast in Switzerland). – One should think that research has been done on this, so I shouldn't need to resort to my subjective perceptions. But three years ago I spent half a day in Google and found nothing on this topic. * Except /v/, which is so nasal that I can't feel any friction in mine, even though I do articulate it as a fricative and not as an approximant – though there are dialects that use the latter in at least some environments. My English /ð/ isn't always audible enough because I nasalize it like /v/; many of my classmates in school didn't even go that far and stuck to replacing it by /d/, even though they had no trouble with /θ/ – voiced friction is a very unpleasant tickling sensation, at least if you aren't used to it. Collins and Mees [...] say "[Dutch fortis plosives] are articulated with considerably greater tension than their lenis counterparts. It is also noticeable that they are much tenser than the English fortis plosives. [...] This is visible as lip compression [for /p/] [...] The release of the closure is brisker [...]" Does this "compensate" for the lacking aspiration? Wow. That ought to mean that (part of?) Yiddish came from pretty far north, contradicting other features like part of the vowel system. Confusing. Eastern Yiddish is a dialect koine, the result of blending of Jewish varieties from every part of the German-speaking lands, so we expect precisely such mixed features. I'm just surprised that aspiration would survive in such a koine. Eastern Yiddish is a group of dialects of Yiddish, the origins of which are most closely connected to the Franconian dialects of (Middle or maybe Old High) German. Not entirely clear, but it's certainly not a mix of all German or even all High German dialects. In rather recent times, aspiration was one of the features that was adapted to local non-Jewish German dialects. The interesting thing isn't that it survived in a koine, but specifically after centuries of Slavic environments.